Methodism first came to Eltham in the mid-19th century, when it was still a village outside London. Sergeant William Rudd, a serving soldier in the Royal Artillery stationed at Woolwich, preached in the local area. He was by this time a man of 60, but he gathered a group of fellow-enthusiasts in Eltham, and they used to meet as a Methodist Society in the local houses. By 1838 they had raised enough funds to buy a site in Elizabeth Terrace, just off the High Street. They built a small Methodist chapel, which was opened in 1840. The chapel thrived for 20 years, serving local people and many soldiers and their families. However, by 1859, the soldiers had been withdrawn to fight in the Crimean War, and the chapel was sold to the Bible Christian Connexion. The building was later demolished, but the foundation stone was retrieved by Rev Ralph Bates in 1935, and can still be seen in the vestibule of our present church. The turn of the century brought the Bexleyheath Railway and new homes for families on the Corbett Estate. The newcomers included many Methodists, probably encouraged by the ‘no licensed premises’ rule which Corbett made a condition of building the estate. Initially, they met as a Methodist Class in the home of Mr. Johnson of Earlshall Road. They were able to raise £860 to purchase the present site on Westmount Road between Earlshall Road and Elibank Road. In 1902 they erected a temporary iron church at the rear of the site. This temporary building was used for worship for two years, but it was not demolished: it became known fondly as ‘The Tin Hut’ and was moved to the Elibank Road side of the site when no longer required for worship. It was used by women war workers under the leadership of Sister Amy Yeo, and also by the Boys Brigade and Beginners’ Sunday School, until it was finally demolished in the 1960s. Under the guidance of the Chair of the District, Rev. Dr. Walford Green, and the leadership of the minister, Rev J.J.Johnston, a new church was planned and built. The building known as The Church Room (now called The Small Hall) was opened and used for worship on Sept 10th 1904. On April 25th 1906 the present church was opened as Walford Green Memorial Church, dedicated to the memory of the man who had done so much to bring it into being. It cost £7500 to build. It was at this time that the tradition of fund-raising began at Eltham Park. The bazaars of this period were grand affairs, often lasting all day Friday and Saturday. This was a period of rapid expansion at Eltham Park. Not only was the Corbett Estate completed, but also the Hutments and Progress Estate were erected for workers in Woolwich Arsenal during the 1914-18 war; and church membership grew to 350. Its work expanded to meet the needs of the growing community. The Sunday School became a large institution of over 400 children. Thus, in 1920, plans were made for the building of the New School Premises, which demanded yet more fund-raising. One bazaar raised £1162, which both cleared the debt on the church building and provided £700 for the new buildings. In 1923 the New School Premises were opened. Two halls, one with a raked floor and stage, were built where the new hall, car park and Wesley Hall flats now stand. The cost was £500 and the debt was cleared by 1925. In 1927, the church organ, begun in 1907, was completed. In 1928, the Grand Empire Bazaar ran for 3 three days in May. These years were an era of full congregations, large choirs, and enthusiastic, all-embracing social activities. Eltham Park Methodist Church was for many the social focus of their lives as well as their spiritual home. 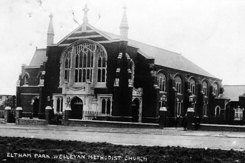 Wesley Guild, Missionary Meetings, pageants, musical productions, Sunday School activities, tennis, football, and badminton clubs were all features of our church life in those days. Until the beginning of World War II the church continued to thrive. In 1938 the children and young people of the Sunday School began the tradition of joining the early part of regular Sunday morning worship in addition to their usual classes. But the outbreak of war meant that the church family became separated. Evacuation and call-up to the armed services scattered members far and wide. The government requisitioned the Sunday School halls. Church life went on, however. A forces canteen was provided, and a study room for men stationed at the nearby barrage balloon sites as well as some from Woolwich Barracks. The church gave support through the trauma of the war and the subsequent difficulties of rebuilding lives and the community. The social activities continued, as a support to regular worship. A particularly popular group was the Young People’s Fellowship which provided study, socials, and weekends away. In 1951, there was another marathon bazaar to pay for the restoration of the church after the war. The church began to grow again, with new families moving to the area and children of the post-war baby boom filling the Sunday School and youth groups. These years saw the growth of the Eltham Park Players, formed in 1943 by Mrs Masters. They performed regular productions in the old large hall until 1963. Members of all ages participated, and they even undertook two film productions on Biblical themes. The one called ‘Nativity’ was filmed partly at London Zoo – wise men on camels – and partly at a farm in West Peckham where the donkeys were less than helpful… Sadly the films have not survived. Church work continued apparently as before, a new feature being the garden parties held in members’ gardens every summer. However, church finances were in trouble, so the Stewardship Campaign was launched. The need for the regular giving of time, money and talents was more securely grasped by the congregation. The finances improved, and new families came into the church. As part of the Stewardship Campaign, it was decided to modernise the front of the church and improve the halls. The choir stalls and apse were covered with a screen and the large central cross erected at the centre of the new communion area. The Tin Hut was demolished so that the buildings could all be linked and improvements were made to the kitchen. Youth work continued with the formation of the Rif-Raf Youth Club under the leadership of Reg Deadman. The 1980s brought crisis to the church. The halls were subsiding and required major work. An ambitious plan was launched to redevelop the church, demolish the old halls, sell some land for the Wesley Close flats, and build a new hall. The fund-raising committee became known as Target 90. A number of events helped to raise the money needed, and the minister, Rev. Gerald Brown, was adept at sourcing grants and loans. The development programme caused major upheaval and for a time worship took place in the new hall (now called Large Hall). Despite this, the congregation grew once more. The youth club became Maggie’s Mob and both young and old took part in many entertainments together, as well as socials and church walks. The 80th and 90th anniversaries were celebrated with friends old and new. The centenary celebrations went on all year, with special services, a visit from the President of Methodist Conference, a performance of The Messiah, many social activities, and a centenary dinner. The anniversary services in May were attended by many past members and old friends from around the country. A special banner was created to celebrate the variety of church life in 2002. The arrival of Rev Robbie Riddell coincided with the need for refurbishment and new funds. The church was encouraged to make better financial use of its building assets and a much more ambitious programme of lettings was embarked upon. A sister Christian congregation, the Rhema Church, began to hire our premises every Sunday afternoon. This soon extended to Friday and Saturday lets as well. The Rhema Church is now firmly established at Eltham Park, and we enjoy visits from their pastor, Rev. Eric Otoo, to our pulpit. Other lettings to a variety of groups have continued to grow. An unexpected legacy from a very faithful member of our church enabled us to embark upon a major overhaul of heating, lighting and redecoration which in turn made our premises very attractive to others as well as much more pleasant to ourselves. This phase of work is only just coming to an end. The organ was replaced with a modern organ, new piano and electronic instrument. Recently, the outside of the premises have been better maintained. The website was launched and praised for its design and liveliness. However, by 2016 this had declined in effectiveness and this year has seen a thorough review, revamp and relaunch of our website. At the same time, the sound system has been overhauled and re-wired, and a new projection system has added a new dimension to Sunday worship. In recent years, like so many churches, our numbers have declined, with the sad loss of several much-loved and long-standing members of our church. However, we have also seen new members joining, and staying; and new initiatives, such as Toddler Church and Messy Church, have proved highly popular, bringing in many new young people to enjoy different ways of being a church together in the 21st century. Based on material from church archives and eye-witness accounts.